barring it from being sold to any other nation. But since no other nation is building such a plane to challenge it, the F-22 has become a costly investment with an uncertain payoff, and Defense Secretary Robert Gates just killed it. That sent an unmistakable message to the two new top Air Force officials Gates recently appointed, and now the service is seeking 100 slower, lower-flying and far cheaper airplanes  most likely prop-driven  that it can use to kill insurgents today and use to train local pilots  such as Afghans or Iraqis  tomorrow. self-sealing fuel tanks  and ejection seats if those protections fail. It should convert from an attack plane to a trainer by simply removing those weapons. basic trainer, and Brazil’s Embraer EMB-314 Super Tucano, which the U.S.
Navy may buy to support SEAL missions. 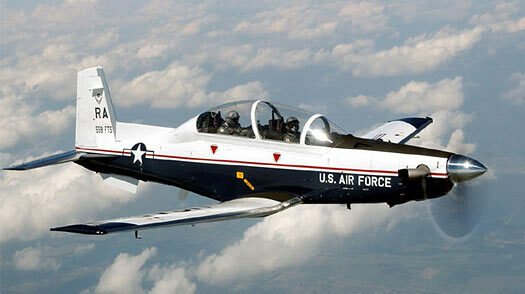 After being trained on the aircraft, foreign forces could buy such planes for their own use.